Baby shower games are an excellent addition for a memorable party. Fun & Memorable Baby Shower. Baby shower games are an excellent addition for a memorable party, to celebrate the new parents-to-be. A well planned baby shower party should have an end result of the new parents receiving many of the items that they will need when the baby arrives. Diapers and formula are quite expensive, so any items that come via a baby shower party can really curb some of that expense for a while. A fun baby shower party should have a good mix of ice breaking, energizing, baby shower games. They are a great way to get everyone up and involved, having fun. You should plan on two or three baby themed games. 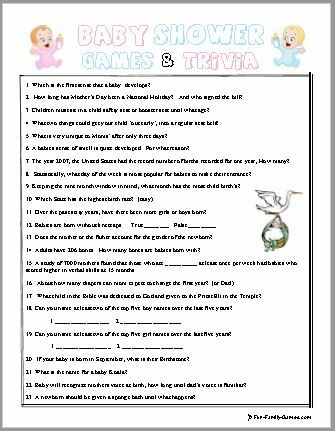 Good resources for a variety of baby shower games are the online, printable games. They come with a good selection and with one low price you can print as many as you need. 1)Guess Who, the Baby Version - In this game, players are each given a piece of paper with the name of a famous person on it. They do not look at the name, but tape it to their forehead. They then must figure out who they are by the reactions, hints of the other guests. Consider using only famous celebrity mothers, or perhaps cartoon characters. Be creative! 2)Tips for the New Mom - Have someone write down a short piece of advice to the new mother. Then have the next person write down a line to create a poem about advice they have for the new mom. Continue with each guest adding a line, but each time, fold the paper so that the only line visible is the last one that was written. At the end, have someone read the finished poem. It is sure to contain lots of good advice in quite a funny way. 3)Future Notes for Baby - Have each guest write a short note to the baby. Seal the notes in a plastic bag and place them in a box for the mother-to-be, telling her she can open them with her child on his or her fifteenth birthday. 4)Build a Tower - Have guests stack as many diapers as they can without the tower falling over. Of course, the mother-to-be gets to keep the diapers! 5)Smell the Diapers - Buy ten different chocolate candy bars (Snickers, Hershey's, etc.). Melt the bars and put each into a separate diaper. Hang diapers along a clothesline before the guest arrive. Give each guest a piece of paper and have them smell all the diapers (take lots of pictures!). The winner is the guest who correctly identifies each candy bar. 6)Are You Hungry? - Bring in a tray of various baby foods, with the labels removed. Number each bottle and have the guests look at each (no tasting or smelling!) and write down what they think it contains. The winner is the person who identifies the most correct foods. 7) Pass the Pacifier - Have everyone put a pen or pencil (or chopstick) in their mouth. Place a pacifier on the end of one of the pencils. Guests must pass the pacifier around the circle without using their hands. If a guest drops the pacifier, they are out. The winner is the last person still in the circle. 8)Guess Who?, is a real fun game where guests are asked to bring a picture along of when they were a baby. Participants in this game join in the fun by identifying the picture and putting the right face to the right person. Gifts for the winners of the baby shower games can vary, but something inexpensive like shower gel or coffee will do nicely. Or guests can rack up points for each game they play (100 to the winner, 90 to second place, etc.) and at the end of the night the grand prize winner can take home something a little nicer, such as a restaurant gift certificate or bottle of wine. If the new mother gets plenty of items she needs, and the guests leave with prizes, all are happy! One way to get something every mother needs: tell guests that there is going to be a raffle, and the cost of entry is a pack of diapers. They can enter as many times as they would like. Then either buy or make a gift basket. For instance, the prize could be a bottle of wine, pasta, sauce, parmesan cheese, and some yummy cookies in a basket. It could also be a gift certificate to a restaurant or spa. This will keep the new mother in diapers for quite a while!